Developer: E! Entertainment Television, Inc. Pop culture. Personalized. The Emmy®-nominated E! News app has everything you need to know, right when you need to know it. Here's what you get with the E! 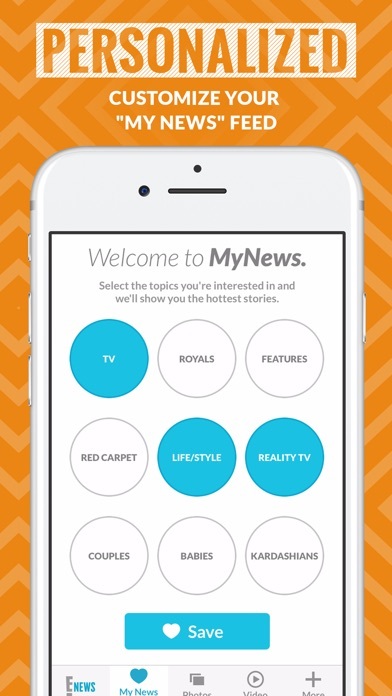 News app: • Customize your content feed with the My News feature. • Find a specific photo, or swipe thru them all! The choice is yours with our interactive gallery experience. • Watch the latest E! News videos and behind-the-scenes extras from your favorite E! shows like "Keeping Up With the Kardashians," “Life of Kylie," “Botched,” “Total Divas" and “Hollywood Medium With Tyler Henry.” • Be the first to know breaking news with our mobile alerts! • Keep up with the latest style trends and beauty tutorials. • Tune in to our exclusive livestreams, including "Live From E!" and "Live From the Red Carpet.” • Share everything from E! News with your friends on social media, directly from the app. Connect with us! Website: Eonline.com Facebook: Facebook.com/enews Instagram: Instagram.com/enews Snapchat: snapchat.com/add/e_news Twitter: Twitter.com/enews Newsletter: Eonline.com/newsletter We're always happy to get your feedback to help us improve the app. Email us at [email protected] For full TV episodes, download the E! Now app, available in the App Store. E! Entertainment Television, Inc. This app features Nielsen proprietary measurement software which will allow you to contribute to market research, like Nielsen’s TV Ratings. To learn more about our digital measurement products and your choices in regard to them, please visit http://www.nielsen.com/digitalprivacy for more information. I deleted and reinstall this app recently because it almost never just opens automatically. It didn’t work. I have had issues with it in the past also. Why can’t they fix this thing? I will just delete it I guess because it’s useless. The app doesn’t open and load, and if it does open it takes too long. The mobile ad tied to Target(their red & white emblem) appears and blocks ANY viewing of ANYTHING. You need to fix this or you will lose everybody! This is obviously some trick by an ad company. Somebody must have tried to be funny at your expense. All it did was make you look stupid and piss people off. On my iPhone XR, the upper left back (arrow) button to return from an article or pics back to main page won’t work. I tap it over and over again and it won’t work. I end up having to exit app to get back to home page. It is very problematic. Please fix. I love the app when it’s working however it crashes every week for DAYS at a time!!! Will be deleting it. Keeps me updated on everything, the best !!! I've been using this app for years and it no longer opens after the last os update. I love E! it’s where I chose to get the “news” every day. I hate the nightly news it’s full of hate, violence and politics. But seriously the grammatical errors are ridiculous. Take pride in your work as a journalist. Also I wish there was more. It seems that there are several stories about the same people. There are so many celebrities to write about but the website only has a few celebs and several articles about them everyday. App hasn’t worked for about a week now. I hope it gets fixed soon or else will have to delete. What happened to the quality of this app? It’s so clunky to scroll through pictures, constant pop ups. I’m deleting until the quality comes back. I love staying in the now thanks for the updates. Keep them coming ...Bead Pitt and Leo D. I can’t wait. Sometimes I click on the pop-up notifications for the app to bring me to a specific story I’ll go to look at the picture and naturally hit the back button when I want to read the article unfortunately it brings me back to all of the articles and not just from the picture to the article which is extremely frustrating because then I have to search through everything to find the original article I was trying to read. Which is difficult there is a lot to go through and I don’t usually find what I’m looking for if it’s been a little bit of time since it was originally posted. I would love a search option so I could look up the title or topic of what I was trying to read. It’s extremely frustrating! Often times I end up having to just go to google and searching for The topic there. Usually I’m not finding it on me either. This app is super annoying in that it makes any music that I have playing stop when the app is opened. This app USED to be so good. Now it’s such crap!!! It freezes literally every two minutes. I can’t believe how bad it is. What a waste! Every time I get a notification about breaking news and go to the app, I get a message of “Oops, something went wrong” or can’t get into the app at all. Ready to delete app. It’s great news and love the variety ! I’d like to see more news breaking stories about royals and important personalities , more family relAted. subjects. The app now has more videos than articles and I can’t tell what’s a video or an article until I click on it. Doesn’t anyone write or read anymore! May delete app because it has become frustrating. Overall, I enjoy this app. However, the current way you have to view photos needs some serious work. First off, the pictures are for the most part, too small. You can’t zoom in, and if there are words on the pictures, you have to awkwardly scroll upwards, which causes you to mistakenly click on other pictures in the process. If this one feature were redone, this app would definitely be four stars! I love E News and the stories are great on this app, but it freezes a lot. It will get stuck often on the logo page, or will crash and close down. I keep having to delete and reinstall it. E! News is mindless entertainment and that’s fine. I just can’t handle the fact that the app is constantly freezing, forcing me to turn my phone off and on, or delete then reinstall the app. It’s frustrating and annoying. It’s getting to the point where it’s just not worth it. I have read articles with misinformation and misspellings. There are also articles that have repetitive sentences/paragraphs. For about a week or so now, every time I open the app, my iPhone overheats. And the brightness decreases on its own. It doesn’t happen with any other app. Anyone else?? This app doesn’t even open, what good is convenience when it is too frustrating to use and doesn’t properly work? Too frustrating and not worth the time! I like the concept, but I can’t stomach the focus on the Kardashian’s. Do they own this app?? I really like how the app is set up and the celebrity news, BUT it freezes up on me A LOT and I have to exit out and reopen the app if I wish to continue. If you love the Hollywood or anything Entertainment Industry related, this is the ultimate source. Upbeat and lighthearted content brings light in these uneven days we live. Whoever came up with the idea of cutting off headlines halfway through should take a long vacation. If they were brilliantly written teasers, you might tempt me to click on them. But they're not. The new format is annoying. It takes a lot for me to delete an app, for any reason. But I hate wasting my time and E News did that one too many times. This isn’t actually news - it’s a promotional tool for the Kardashians and other E! personalities, which make up nearly 90% of the headlines and 10% actual entertainment news. You won’t burn me again E!, and hopefully those reading this will heed my warning and avoid you too. I love the content of the app. I gave it only 2 stars because the app glitches out on me quite frequently. It happens not just one time during a use, but continuously throughout the 10-15 minute use. App constantly crashed to the point where it wouldn’t load for days. I would delete the app and reinstall and it would work for a couple days then crash. I reached out to app support with no response. Finally deleted the app! When it worked, the content was very easy to view and navigate. However, many of the articles had grammar or spelling errors. It would be great if someone proofread the articles. I have had this app for as many years as I can remember and it is one of the first ones I look at each day. That said, I’m on the verge of deleting it. For a free app, such as this, I don’t mind that there are adverts throughout, but I’m getting very frustrated with the pop up ads, particularly the ones with no way to close them. I actually have to restart my phone to close the ad and get back to the content, which is insane!! Also, I’m no English expert, but I would add that the editing of the articles is atrocious. There are often GLARING grammatical errors, such as misspelled or misused words and sentences that make no sense, which makes it difficult to read or take seriously (well, as seriously as one takes celebrity news 😉). I’m not asking for Charles Dickens and I don’t mind the slang or cutsie, light hearted writing style (it totally works for this genre), but something that looks like it was written and proofread by a professional would be nice. On a positive note, I’m so grateful that you changed the auto play of the live video. Please don’t go back to that; it was awful! I was surprised by that on more than one occasion, while sneaking a peek at work. AWKWARD! The videos never have sound on this app. I’ve uninstalled and reinstalled still no sound. This is the only app that has this issue. Probably need to update it to fix the sound issues. By No soup 4 u!! I wish it would quit pausing my music when I open it! I’ve had this app for over a year now and the sound has never worked. I still use it because I read the stories but it would be nice to be able to hear the videos.